Let me start by saying, I am NOT a fan of sweet pickles! I’ve never found a brand or style that I liked. But my husband LOVES them. So I was on a mission to come up with a recipe that pleased him AND me! That’s a tall order on a typical day. We are the epitome of “opposites attract”. I SCORED THOUGH!! 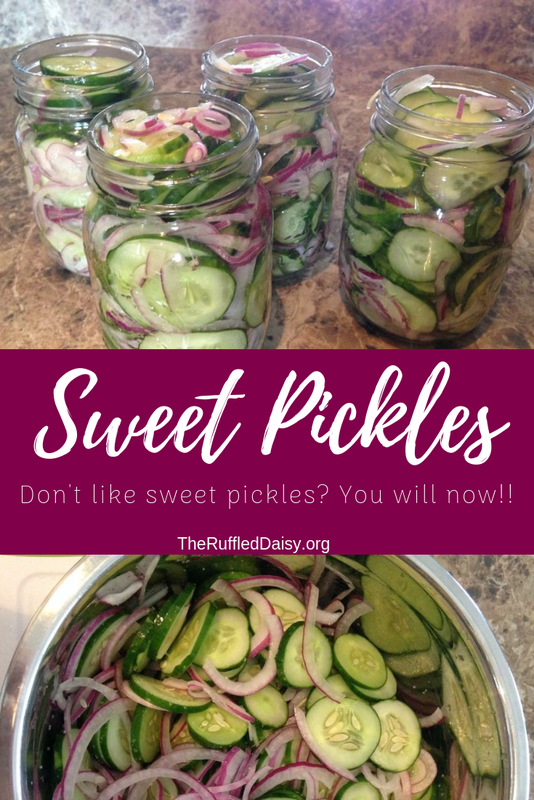 These refrigerator sweet pickles are the ultimate in ALL pickles! Yes, I am claiming that 🙂 These are not your typical canned pickles though. I haven’t ventured into the world of “real” canning yet, so these will only last in your refrigerator for about three weeks. They won’t last that long though – trust me! 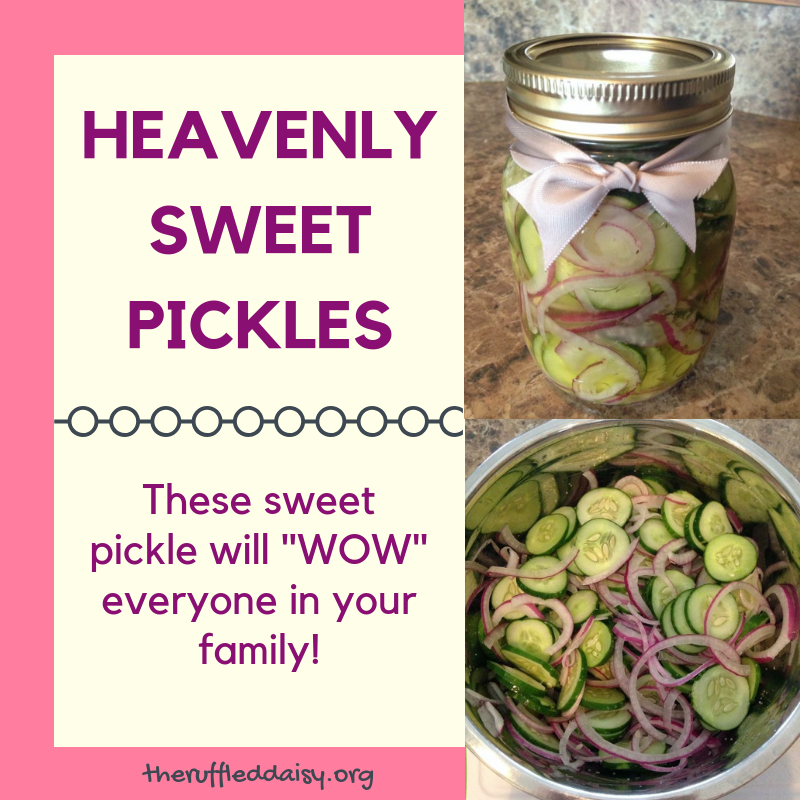 Here’s how you can make your own Ultimate Sweet Pickles! Assemble off of you ingredients along with a large bowl! 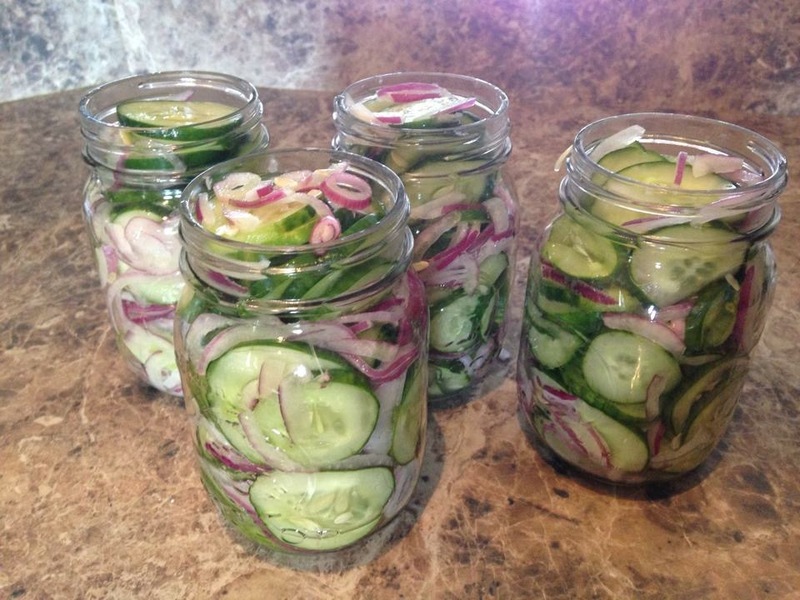 Slice 8 cups of cucumbers o a thickness that you desire. I opted for a medium thickness. You can see in the photo about how thick they are. I sliced one larger onion slightly thinner. Having a mandolin slicer makes this step go super fast! If you don’t have one, THIS one is perfect! 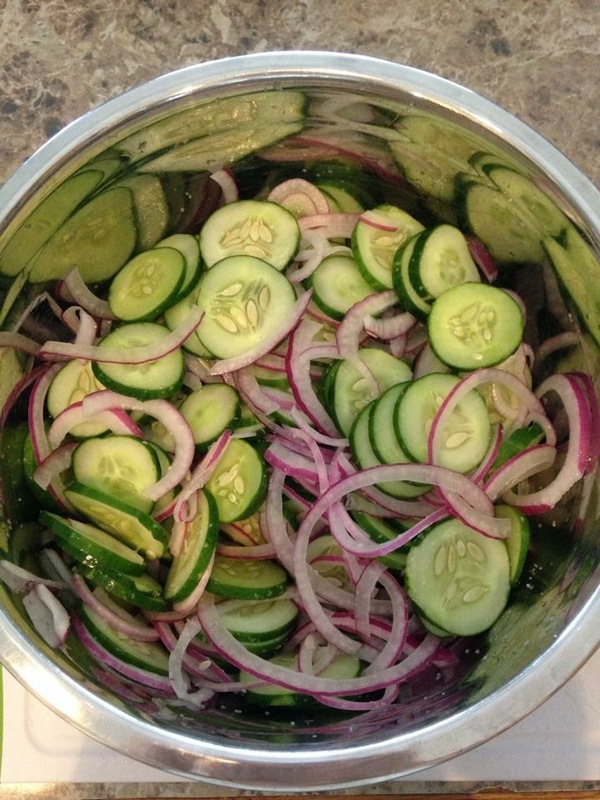 Toss the cut veggies with 1 1/2 teaspoon of kosher salt. In a separate bowl combine the liquid base. 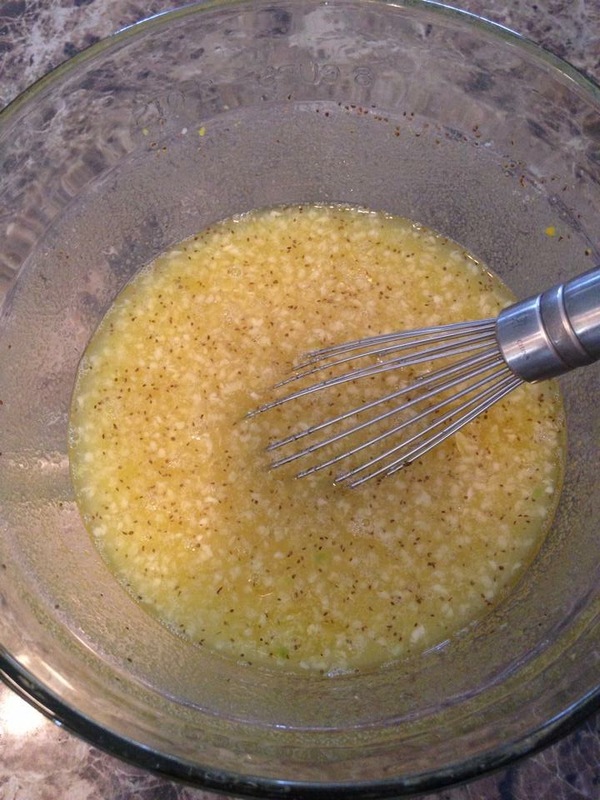 Mix 3 cups of sugar, 1 1/2 cups of white vinegar, 1 1/2 teaspoons of dry or regular mustard, 1 1/2 teaspoons celery seed, and 6 cloves of crushed garlic. 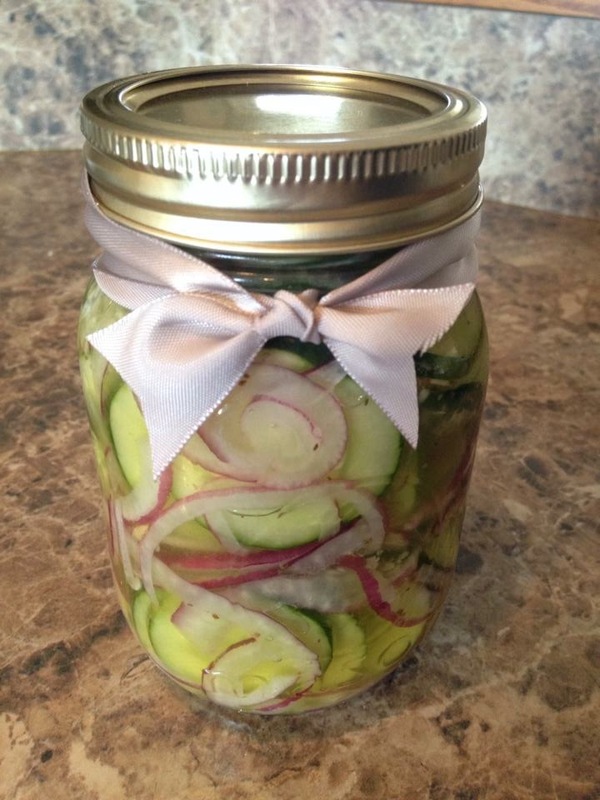 Stuff 4 pint size jars to the brim with the cucumbers and onions. 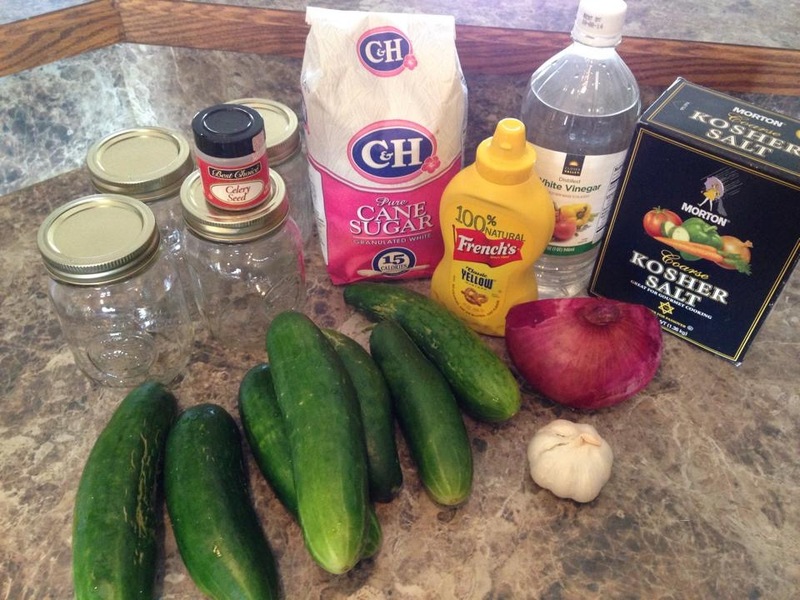 You may have a little more or little less than 4 pints depending on how many cucumbers you used. Slowly add the sugar/vinegar mixture to the jars letting it seep down into all of the open spaces of the jars. Top with a lid and you’re done! You can add a cute ribbon to give as a gift in 24 hours. I’d love if you could PIN this image onto your Pinterest boards so you always know where to find it! Share it with your friends while you’re there! They’re definitely going to be thanking you.